An introduction to some of the members of the local organization, Center for Inquiry Michigan, based in Grand Rapids, and a window into their experiences as non-religious in West Michigan. Find out more about Center for Inquiry Michigan at their website or facebook page. 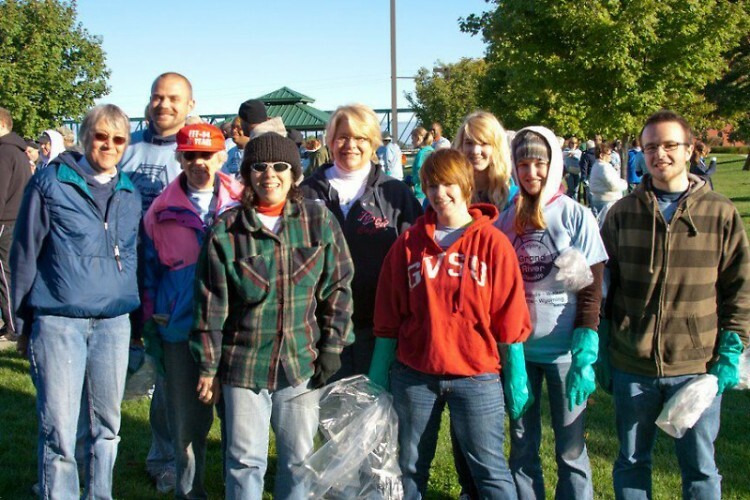 You can also find student branches on facebook at GVSU, GRCC, U of M, and MSU. Also check out their events calendar to find a meeting near you with locations including Grand Rapids, Dearborn, Flint, Lansing, Holland, Ypsilanti, Ann Arbor, Portage, Muskegon, and Kalamzoo. Center for Inquiry Michigan may not be a widely known group, but members report that it has become a very important haven for area non-believers. Center for Inquiry (CFI) is an international non-profit that "encourages evidence-based inquiry into science, pseudoscience, medicine and health, religion, ethics, secularism, and society." It's CFI's mission to support these inquiries with the use of education, research, publishing and social services. But for many area members, it's considered their community and their home. In a country where the majority is religious and predominantly Christian, CFI members say it can be hard to be a non-believer. When asked how they felt when they found CFI, they all use words such as thrilled, excited and happy to find such a welcoming group where they felt so at home and were able to speak their mind. Dren Asselmeier says it was a welcome surprise when she found Center for Inquiry in 2008. 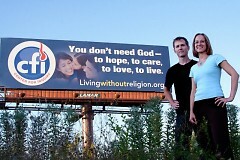 She didn't know any other atheists in West Michigan and didn't feel like she belonged in the conservative community. Asselmeier went on to become student president at the Grand Valley State University branch, was an intern with CFI Michigan and was eventually hired by CFI Transnational office in Amherst, NY where she now lives and works. Many members of Center for Inquiry come from a religious background. Tiffany Ewigleben was raised by a Mormon aunt, and attended a Christian Bible camp with some friends, but she left after some false assumptions were made and a teen leader handed her a pamphlet about abstinence, telling her, "If you pray really hard, God can give your virginity back." Bob Collins, a long-time member of CFI since it was previously the Freethought Association, was raised as a devout Catholic. He said growing up, he became fearful from threats of hell and dying with sin on his soul which lead to much anxiety and lots of prayer. His exposure to secular ideas and science in college began his slow process of giving up religion. When asked about how their secular beliefs have affected their relationships with family and friends, the response from most was "not very much." Ewigleben says, "I don’t have this dramatic –oh I’ve been rejected by everyone I know and love—story. I don’t think many people do." Bob and Sherron Collins both tell of their son who declared that God didn't exist at the age of five. A 17-year-old student who wished to remain anonymous said the worst was with her grandmother when she would do things like "'honor' her with the duty of carrying baby Jesus to the nativity scene as part of the Christmas tradition at her church." As a child who was raised secular, she refused and now says she still feels judged by her grandparents. She also told how many of her friendships were effected when she was much younger, mostly because kids tended to accept what their parents said and to them "atheist" was like a swear word. Since junior high and high school she says she's had a very close knit group of friends, many who started out very religious but have gained some skepticism. Bob Collins tells about one of the common misconceptions associated with atheism and how many people are often concerned about his afterlife thinking he may be going to hell. He says he first asks them what it was like before they had been conceived and uses that as comparison to how he sees his afterlife. Other times he will reinforce their belief in an afterlife and recommends that being an atheist might just be too hard for them as "it requires a lot of courage to just face up to our mortality." Collins' wife Sherron says when she gets the typical shocked reaction at revealing her atheism, she simply reminds them that she's the same person she was before being "unmasked" just moments ago, and the previous relationship resumes. Ewigleben says many people are surprised to find out she's not religious after doing her volunteer work. She goes on to say that she lets her actions dispel the misconceptions about non-religious people. Members of Center for Inquiry hope that the Grand Rapids community at large will become more widely accepting of them. Bob Collins says, "I hope that they will appreciate their freedom of and from religion as may be their choice." The student said, "We are not here to attack your religion. We have every right to believe what we choose, just as you do." Ed Brayton felt that the CFI billboard from last September summed it up well, "We are the same as everyone else – we live, we love, we hope and we care – without a belief in god. I hope others in the community come to recognize that and deal with us as individuals rather than as members of this amorphous group of evil people."